Vishnu means the giver and provider of things. 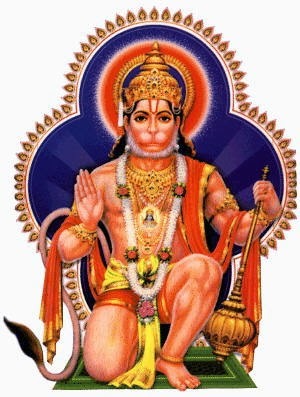 In popular Hinduism, he is the preserver and upholder of dharma and part of the Hindu Trinity. In Vaishnavism, he is the Supreme Self and the Lord of the universe, who manifests variously as part of His obligatory duty. Vishnu, (from the Sanskrit root 'vish', to pervade) is the second god of the Hindu triad (see Trimurti) and as the preserver of the universe represents mercy and goodness. He is said to be the cosmic ocean nara, meaning water, which was the only thing in existence before the creation of the universe. For this reason, he is also known as Narayana, or "one who moves on the waters". Vishnu is represented as a dark man with four arms. In one hand, he holds a club, in another a conch shell (see Shankha), in the third, a discus (Chakra), and in the fourth, a lotus (Kamal). He is usually dressed in yellow robes and therefore also known as Pitambara, or "one with yellow garments". The river Ganga is said to originate from Vishnu's feet. He is also depicted as resting on a coiled serpent Seshnaga or Ananta (see Snake Worship) which floats on the cosmic ocean. According to the Mahabharata, Vishnu's abode, Vaikuntha, is made of gold and .jewels. However, he is usually depicted reclining on Seshnaga, who floats on the cosmic ocean. His vehicle is Garuda, and his weapon is the discus, Sudarshana Chakra. Vishnu's consort is Lakshmi, the goddess of wealth and fortune. She is believed to have emerged from the samudra manthan, and considered to be the daughter of Bhrigu and Khyati. She is a fair woman who wears red clothes, and is always depicted as sitting or standing on a red lotus (see Kamal). She is often worshipped by herself as Sri, Bhagya Lakshmi and Dhana Lakshmi, the goddess of all things auspicious, of good fortune and wealth. Vishnu has several avataras. According to the Puranas and the Mahabharata, whenever there is an imbalance between good and evil on the earth, Vishnu, as the preserver, is born to re-establish the balance. The Bhagavata Purana, among other sources, say that there are 22 avataras of Vishnu. However, the widely accepted belief is that there are 10 avataras, known as the Dashavatara. All the 10 avataras are revered, but the seventh, Rama (see Ramayana), and eighth, Krishna, are believed to be great heroes and worshipped as gods in their own right. Of Vishnu's 10 avataras, the first four are believed to have occurred in the Krita Yuga, the fifth, sixth, and seventh in the Treta Yuga, the eighth in the Dvapara Yuga, and the ninth in the Kali Yuga. The tenth avatara has yet to appear, and it is believed that he will come at the end of the Kali Yuga. The avataras are Matsya, the fish, which appeared in the Krita Yuga. Vishnu assumed this form to save Vaivasvata, the seventh Manu, from the universal deluge that occurs after each Manvantara. In the Rigveda, Vishnu is mentioned 93 times. He is frequently invoked alongside other deities, especially Indra, who he helps in killing Vritra, and with whom he drinks Soma. His distinguishing characteristic in the Vedas is his association with light. This association is found because the lord is indifferent from the Divine Bhramjyoti, which is the cause of material as well as spiritual effulgence. 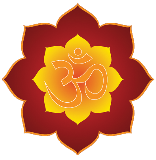 > Two Rigvedic hymns in Mandala 7 are dedicated to Vishnu. In 7.99, Vishnu is addressed as the god who separates heaven and earth. This characteristic he shares with Indra, reflecting an earlier Indo-European myth where a heroic creator god first "cuts" or slays the primeval dragon, and then separates the two halves, thus creating the inhabitable world between heaven and earth. In Greek mythology, these functions became attached to separate deities, especially Cronus and Dionysus. In Vedic mythology, the feat of slaying the dragon becomes the main characteristic of Indra, while the separation of heaven and earth becomes associated with Vishnu. The princes evermore behold / that loftiest place where Visnu is / Laid as it were an eye in heaven. Though such solar aspects have been associated with Vishnu by tradition as well as modern-scholarship, he was not just the representation of the sun, as he traverses in his strides both vertically and horizontally. In hymns 1.22.17, 1.154.3, 1.154.4 he strides across the earth with three steps, in 6.49.13 , 7.100.3 strides across the earth three times and in 1.154.1, 1.155.5,7.29.7 he strides vertically, with the final step in the heavens. The same Veda also says he strode wide and created space in the cosmos for Indra to fight Vritra. By his stride he said to have made dwelling for men possible, the three being a symbolic representation of its all-encompassing nature. This all-enveloping nature and benevolence to men were to remain the enduring attributes of Vishnu. As the triple-strider he is known as Tri-vikrama and as Uru-krama for the strides were wide. The general view is that Vedas place Indra in considerably superior position to Vishnu. As per the English translations of the Rigveda, Vishnu always extols and lauds the Majesty of Indra. He sings the praise of Indra. The eighth mandala of Rigveda clearly says that Vishnu derived his energy from Indra. The three steps of Vishnu was possible only because he derived his energy from Indra. "Step forth with wider stride, my comrade Visnu; make room, Dyaus, for the leaping of the lightning.Let us slay Vrtra, let us free the rivers let them flow loosed at the command of Indra" (Rigveda 8:89:12 ( Several hymns in Vedas explicitly subordinates Vishnu. However, Jan Gonda, the late Indologist, states that Vishnu, although remaining in the background of Indra's exploits, contributes by his presence, or is key to Indra's success. Vishnu is more than a mere companion, equal in rank or power to Indra, or sometime the one who made Indra's success possible. Moreover, even when Vishnu is described as subordinate to Indra, such a description is found in only the hymns to Indra, but in a kathenotheistic religion like that of the Rigveda, each god, for the time being, is supreme in the mind of the devotee. But in the Vaishnava canon the 'Vishnu' who is subordinate to Indra is identified as being none other than the Sun god Suryanarayana or Surya, who has another name Vishnu, and he is different from the Supreme God Sreeman Narayana or Narayana who is referred to as Vishnu by Vaishnavites. Vishnu is not a mere sacrificial deity; he is a God who lives in the highest celestial region, compared with those who live in the atmospheric or terrestrial regions; Moreover, Vishnu is a god who is content with mere prayer, unlike almost all of the other gods who receive sacrificial offerings such as havis or soma. However, in the Rig Vedic texts, the deity or god referred to as Vishnu is none other than the Sun God who also bore the name Suryanarayana, who in turn was also called Vishnu. So the 'Vishnu' referred to in the Rig Veda is none other than the Sun God Suryanarayana or Surya and he in turn, is entirely different from the Vishnu who is Sreeman Narayana (the Lord/Consort of Sree or Lakshmi, who is also the central deity in 'Vishnu Puranam', 'Vishnu Sahasranamam', 'Purusha Sooktham' (wherein he is identified very clearly not as the Sun or Suryanarayana (the purveyor of the skies), but as Narayana or Vishnu and further identified as the Supreme Lord who has Sreedevi (Lakshmi) and Bhoodevi (Goddess Earth or Bhoomi) as his wives/consorts ("Hreeshcha-tey-Lakshmeeshcha-patnyauh"). The Vaishnavites make a further distinction by extolling the qualities of Vishnu or Narayana by highlighting him as a personality or entity much different from other deities like Siva, Brahma or the minor deity Surya the Sun who also bears the name Vishnu. In the Puranas, Indra is described as having the status of the Lord or ruler/administrator of God's abodes i.e. Kailasha, Vaikuntha, Swarga and Naraka where the celestial beings resided with humans inhabiting Bhoomi or Earth. This is indicative of his position being higher or having overlordship over other celestial beings including the Sun God Suryanarayana (Surya), who also bears the name Vishnu, who hence, is a completely different entity who is not to be mixed or confused . However, despite having that status, Indra frequently becomes proud and haughty. This act of his incurs the displeasure of his creators namely Brahma, who along with Siva the Destroyer God start by giving boons to demons or Asuras like Hiranyaksha, Hiranyakashyapu, Ravana, who are able to defeat Indra in wars between the Devas and Asuras. Indra in turn has no option but to take advice of the sages who say that no one can save him but the Protector God Sreeman Narayana or Vishnu the Supreme Lord. Indra goes and prays before Vishnu for protection and the Supreme Lord obliges him by taking avatara or birth or generating himself on Earth in various forms i.e. first as amphibean, water-born being namely the Matsya or fish, then as a creature capable of living on land as well as water, i.e. the Koorma avatara (Tortoise), then half-man, half-animal namely Varaha (the Pig-faced/human-bodied Lord) and Narasimha (Lord with Lion face and claws and human body). Later the same Narayana or Vishnu appears as full-fledged human being in the form of Vamana (the short-heighted person), Ram, Krishna, Balarama or Buddha and finally as Kalki avataram for performing his task of protecting his devotees from the Asuras or anti-God, anti-religious entities. The Vaishnava canon claims absolute clarity in identification of the Supreme Lord Vishnu (Sreeman Narayana or Narayana) from the Vishnu of the Rig Veda who they claim is none other than the Sun God Suryanarayana, who incidentally is also bears a secondary name Vishnu. In the Vaishnava canon, Lord Vishnu or Sreeman Narayana who is their Supreme God. They believe the Vishnu of the Rig Vedas to be the Sun God Surya or Suryanarayana, who was also called and worshipped as Vishnu during the Rig Vedic period. This is borne out by the fact that neither are there no temples of the Vedic God Indra, nor is there any pronounced importance followed by worship of Indra in the Hindu religion, which practice was discontinued after Indra's defeat at the hands of the demons and Asuras and his forced abdication from the throne. Following this Vishnu takes his avatarams on earth and saves mankind, this according to the Vaishnavite canon led to Vishnu taking the place of the Supreme God with him not being worshipped and eulogized by Vaishnavites but also getting recognized by Shaivites and the Smarthas. A direct consequence of this was the almost complete absence of Indra from Hindu temples from the deities being considered fit for worshipping. 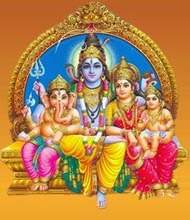 A glaring example being quoted in support of non-worship of deities like Indra or non-prominence of other major Gods like Shiva, Brahma (who is in any case not having more than a temple or two on earth) by Vaishnavites is the fact of their Supreme Lord Vishnu or Narayana taking avatarams to defeat and kill either the demons or Asuras like Hiranyaksha, Hiranyakashyipu or Ravana who have vanquished Indra himself and/or demons who have empowered themselves by pleasing and getting boons from other powerful Gods like Brahma and Shiva. These demons received boons making them virtually indestructible by any person. But Narayana or Vishnu outwits them by appearing as half-human half-animal before demons like Hiranyakashyipu (who had taken a boon that he will not be killed at any specific time of the day or by any human or animal) or Ravana (who becomes invincible by taking a boon from God Shiva that he will not be killed by any Deva - a celestial being with godly powers) who is considered the greatest among devotees of Shiva gets slayed by Vishnu, who appears before him as a mere human being i.e. Lord Rama, the son of Dasharatha. The Vaishnava canon thus claims supremacy of Vishnu even among the Gods by quoting his victories over or killing of those very powerful entities who are themselves devotees of other Gods like the creator Brahma or the destroyer Shiva. The Vaishnava canon finally distinguishes Narayana or the Supreme Lord Vishnu from other deities like Shiva the Destroyer or Brahma the creator, first by pointing out the accepted iconography or sculptures of Vishnu in reclining position as having the creator Brahma sprouting or emerging from Vishnu's navel i.e. showing Brahma himself as having been created by Vishnu out of his own person. This is interpreted as the creator being created by his own creator i.e. Brahma himself being created by Vishnu and going on to create the Universe on the instructions of Vishnu. Secondly, there is the act of the creator Brahma and the destroyer God Shiva go on to give boons to demons or Asuras and as a consequence of granting boons to evil beings, they divest themselves of their powers to eliminate them, which are now vested with the Supreme Lord among the Gods i.e. earth to slay or defeat those demons. This is again interpreted as the triumph of Lord Vishnu or Narayana because it would mean that Shiva and Brahma can only grant boons to good beings and since they cannot distinguish between the two types of beings, they have to entrust this responsibility to the God who protects all good beingsthey have no option but to leave all devotees under the care of the Protector Lord, i.e. the Supreme Lord of the Vaishnava canon, i.e. Lord Narayana or Vishnu. Third and lastly, the Vaishnava canon makes the final distinction in addition to the above two qualities of Lord Vishnu or Narayanato reinforce his pre-eminence and supremacy among all the Gods because Sreeman Narayana or Vishnu in his myriad forms never ever grants a wish to evil beings, as is done according to the Puranas by both the creator God Brahma or the destroyer God Shiva. So they regard Sreeman Narayana or Vishnu as a protector God who makes a clear distinction between bad and good beings and never favours or grants boons or wishes to evil entities as would be done by both Shiva and Brahma and is thus regarded by them as the only God worthy of worship as the preferred deity. The above actions of Vishnu automatically led to the lowering of status of Indra among Hindu deities and leads directly to the ascendancy of Vishnu or Narayana, as per the Vaishnava canon. In the Rigveda, Shakala shakha: Aitareya Brahmana Verse 1 : "Agnir vai devānām avamo Viṣṇuḥ paramas, tadantareṇa sarvā anyā devatā" declares that Agni is the lowest or youngest god and Vishnu is the greatest and the oldest God. In the Brahmanas, the supremacy of Lord Vishnu is clearly announced. Here He is repeatedly addressed as "Yajnapati" or the one whom all the sacrifices are meant to please. Even if the sacrifices are offered to the demigods, Lord Vishnu is the one who accepts the sacrifice and allots the respective fruits to the performer. There is mention of one such incident where a demonic person performs a sacrifice by abducting the rishis (Sanskrit name for sages who constantly meditate by chanting God's name) forcefully. The sacrifice was meant to bring about the destruction of Indra. But the rishis,who used to worship Indra as a demigod were intelligent enough to alter a single pronunciation of the ved-mantra. The purpose of the entire sacrifice was reversed. When the fruit of the sacrifice was given, when the demon was on the verge of dying, he clearly calls out to lord Vishnu,whom he addresses as Supreme Godhead and "the father of all living entities including himself". Aitareya Brahmana: 1:1:1 mentions Vishnu as the Supreme God. But in the Vaishnava canon, in different ages, with Vishnu in different forms, his relationship with the 'asuras' or evil-beings including demons (Hiranyaksha and Hiranyakashyipu were considered demons) has always been adversarial, with the asuras always causing harm or killing good beings including sages and devotees of Vishnu, with the sages and 'devas' (celestial beings including Indra - not considered a God in Vaishnava canon) doing penance and calling out to Lord Vishnu for protection. In response to the call of devotees and being described as the one and only saviour of the world, Sreeman Narayana or Vishnu, being the Protector God, always obliges by taking avatarams (incarnations as Narasimha, Rama etc.) to finally vanquish and eliminate the asuras. In the Vaishnava canon, Narayana or Lord Vishnu is clearly defined as one who has never given or granted any boons to the asuras (to clearly distinguish him from other Gods like Shiva and Brahma, who granted boons to demons or evil beings), but he is the only God called upon to save good beings by defeating or killing the very evil beings who became powerful or even invincible after being granted boons by the destroyer Shiva and the creator Brahma. Sayana writes that Aitareya Brahmana 1-1-1 ("Agnir vai devānām avamo Viṣṇuḥ paramas,tadantareṇa sarvā anyā devatā") doesn't indicate any hierarchy among gods. Even in Rigveda Samhita, where avama and parama are not applied to denote rank and dignity, but only to mark place and locality. In Rigveda 1:108:9,: yadindrāghnī avamasyāṃ pṛthivyāṃ madhyamasyāṃ paramasyāmuta sthaḥ |, i.e., in the lowest place, the middle (place), and the highest (place). Agni, the fire, has, among the gods, the lowest place; for he resides with man on the earth ; while the other gods are either in the air, or in the sky. Vishnu occupies the highest place ; for he represents (in the Rigveda) the sun in its daily and yearly course. The words 'avama' and 'parama' is to be understood as 'First' and 'Last' respectively. To prove this meaning to be the true one, Sayana adduces the mantra (1,4. As'val. Sr. S. 4, 2), agnir mukham prathamo devatanam samgathanam uttamo Vishnur asit, i.e., Agni was the first of the deities assembled, (and) Vishnu the last. In the Kausitaki-Brahmana (7, 1) Agni is called avarardhya (instead of avama), and Visnu parardhya(instead of parama),i.e., belonging to the lower and higher halves (or forming the lower and higher halves). [ Te Vishnu Purana gives tremendous importance to the worship of Vishnu, but mentions that sacrifices to Sreeman Narayana are to begin only with both the lighting of fire or 'Agni', pouring of sacrificial offerings to Narayana or Vishnu in 'Agni' so that those offerings reach the Supreme God Vishnu and are accepted by him. Worship of Lord Vishnu through Yagnyas (or Homams) and other rituals, will not bear fruit or the desired result in case 'Agni' is not given any role in the process. Prof.Muller says "Although the gods are sometimes distinctly invoked as the great and the small, the young and the old (Rv. i. 27. 13), this is only an attempt to find the most comprehensive expression for the divine powers, and nowhere is any of the gods represented as the slave of others. It would be easy to find, in the numerous hymns of the Veda, passages in which almost every single god is represented as supreme and absolute" . In the Bhagavad Gita, Krishna, an avatar of Vishnu, teaches Arjuna the nature of the Supreme being and the different processes of Yoga, ultimately culminating in devotional surrender, similar to that of the catursloki of the Bhagavata Purana. "I am the goal, the sustainer, the master, the witness, the abode, the refuge, and the most dear friend. I am the creation and the annihilation, the basis of everything, the resting place and the eternal seed." "But what need is there, Arjuna, for all this detailed knowledge? With a single fragment of Myself I pervade and support this entire universe." "If hundreds of thousands of suns were to rise at once into the sky, their radiance might resemble the effulgence of the Supreme Person in that universal form." "Abandon all varieties of religion and just surrender unto Me. I shall deliver you from all sinful reactions. Do not despair. 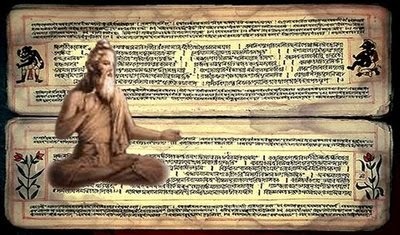 The Viṣṇu Smṛti (700-1000CE) is one of the latest books of the Dharmaśāstra tradition of Hinduism and also the only one which does not deal directly with the means of knowing dharma, focusing instead on the bhakti tradition and requiring daily puja to the god Viṣṇu. It is also known for its handling of the controversial subject of the practice of sati (the burning of a widow on her husband’s funeral pyre).The text was not actually composed by the sage Viṣṇu himself, but rather by an individual or group writing much after his death. This group brought together a collection of all of the commonly known legal maxims which were attributed to the sage Viṣṇu into one book as the Indian oral culture began to be recorded more formally. Vishnu takes form as an all-inclusive deity, known as Purusha or Mahāpurusha, Paramātma [Supreme Soul], Antaryāmi [In-dweller], and he is the Sheshin [Toin om all souls are contained. Vishnu is the only Bhagavan (which in Sanskrit means "possessing bhāga Divine Glory"), as declared in the Bhagavata 1.2.11 in the verse: "vadanti tat tattva-vidas tattvam yaj jnanam advayam brahmeti paramatmeti bhagavan iti sabdyate". The meaning of the verse is as follows: "Learned transcendentalists who know the Absolute Truth call this nondual substance Brahman, Paramatma and Bhagavan. "The substantives of the word bhagavat (bhagavat-śabda-vācyāni) are unlimited (aśe??s.atah.) knowledge (jñāna), energies (śakti), strength (bala), opulence (aiśvarya), heroism (vīrya), splendor (tejas), without (vinā) objectionable (heyair) qualities (guṇādibhiḥ)." Tèjas Resplendent, or Splendour, which expresses his self-sufficiency and the capacity to overpower everything by his spiritual effulgence; cited from Bhakti Schools of Vedanta, by Swami Tapasyananda. However, the actual number of auspicious qualities of Vishnu is countless, with the above-mentioned six qualities being the most important. Other important qualities attributed to Vishnu are Gambhirya (inestimatable grandeur), Audarya (generosity), and Karunya (compassion). Natya Shastra lists Vishnu as the presiding deity of the Sringara rasa. The Rigveda says: Vishnu can travel in three strides. The first stride is the Earth. The second stride is the visible sky. The third stride cannot be seen by men and is the heaven where the gods and the righteous dead live. (This feature of three strides also appears in the story of his avatar Vamana called Trivikrama.) The Sanskrit for "to stride" is the root kram; its reduplicated perfect is chakram (guņa grade) or chakra (zero-grade), and in the Rigveda he is called by epithets such as vi-chakra-māņas = "he who has made 3 strides". The Sanskrit word chakra also means "wheel". That may have suggested the idea of Vishnu carrying a chakra. In the Para Form, Para is the highest form of Vishnu found only in Sri Vaikunta also called Moksha, along with his consort Lakshmi, (and Bhuma Devi and Nila devi, avatars of Lakshmi) and surrounded by liberated souls like Ananta, Garuda, and a host of Muktas (liberated souls). In the Vyuha form which itself divides into four, Vishnu assumes four forms, which exercise different cosmic functions and controls activities of living beings. In the Vibhava form, Vishnu assume various manifestations, called Vibhavas, more popularly known as Avataras from time to time, in order to protect the virtuous, punish the evil-doers and re-establish righteousness. In the Antaryami; "Dwelling within" or "Suksma Vasudeva" form, Vishnu exists within the souls of all living beings and in every atom of matter. During the Vedic period, both Vishnu and Shiva (as identified with Rudra) played relatively minor roles, but by the time of the Brahmanas (c. 1000-700 BCE), both were gaining ascendance. By the Puranic period, both deities had major sects that competed with one another for devotees. Many stories developed showing different types of relationships between these two important deities. Sectarian groups each presented their own preferred deity as supreme. Vishnu in his myths "becomes" Shiva. The Vishnu Purana (4th c. CE) shows Vishnu awakening and becoming both Brahmā to create the world and Shiva to destroy it. Shiva also is viewed as a manifestation of Vishnu in the Bhagavata Purana. In Shaivite myths, on the other hand, Shiva comes to the fore and acts independently and alone to create, preserve, and destroy the world. In one Shaivite myth of the origin of the lingam, both Vishnu and Brahmā are revealed as emanations from Shiva's manifestation as a towering pillar of flame. The Śatarudrīya, a Shaivite hymn, says that Shiva is "of the form of Vishnu". Differences in viewpoints between the two sects are apparent in the story of Śarabha (also spelled "Sharabha"), the name of Shiva's incarnation in the composite form of man, bird, and beast. Shiva assumed that unusual form to chastise Vishnu in his hybrid form as Narasimha, the man-lion, who killed Hiranyakashipu, an ardent devotee of Shiva. However, Vaishnava followers including Dvaita scholars, such as Vijayindra Tirtha (1539–95) dispute this view of Narasimha based on their reading of Sattvika Puranas and Śruti texts. On the other hand, the Vaishnava canon and texts also make a pointed reference not only to Lord Vishnu's entity as being separate from the other Vishnu namely the Sun God Suryanarayana, they also give pride of place among Gods or deities considered fit for worshipping, namely Brahma the creator and Shiva the destroyer. These canons specifically point out to Vishnu or Narayana's prominence by making him the only deity taking incarnations to come to earth and free or save his devotees and other good beings suffering at the hands of the asuras or evil-beings who have gotten ill-gotten strength, power and invincibility merely by worshipping Brahma or Shiva and getting boons from them in the process. As per the Vaishnava canons, while regarding both the creator Brahma and the destroyer Shiva as powerful, their granting boons to evil beings renders them powerless to punish because it is their boons or varams that made evil beings like Hiranyakashipu, Hiranyaksha, Ravana very powerful, enabling them to win wars against the Devas or celestial beings led by Indra and causing sufferings to good beings like the sages and other God-fearing humans on earth. So all beings whether the Devas or ordinary humans have no option but to pray and plead before Lord Vishnu or Sreeman Narayana to save them from the asuras. As per the Vaishnava canons, even Brahma the creator and Shiva the destroyer, join the devas in exhorting and persuading Sreeman Narayana or Lord Vishnu to take incarnations, go to earth for confronting and killing the very asuras or demons or evil-beings, to whom they themselves have granted boons. Not just this, but both the creator Brahma and Shiva the destroyer also play supportive roles by keeping company of Lord Vishnu in his incarnated forms. Hanuman half human and half-animal and completely dedicated to Ram who gives him company and obeys his command while playing an important part in Ram's life is regarded in Vaishnava canon as being none other than Shiva the destroyer only, because it is through the blessings of Shiva that Hanuman is born to his mother Anjani for he also bears the name Anjaniputra. Syncretic forces produced stories in which the two deities were shown in cooperative relationships and combined forms. Harihara is the name of a combined deity form of both Vishnu (Hari) and Shiva (Hara).This dual form, which is also called Harirudra, is mentioned in the Mahabharata. The complimentary relationship between Shiva and Narayana or Vishnu is emphasized both in the Vaishnava canon as well as in Shaivite texts through the story behind the Lord Ranganatha temple in Srirangam. Vibhishana, the brother of Ravana is made the king of Lanka by Lord Ram after which Lord Ram goes to Ayodhya where he becomes King after a coronation ceremony. This ceremony is attended among others by Vibhishana, who is sad at having parted company with Lord Ram. Valuing Vibhishana's friendship, Lord Ram gives him the idol of his family deity of Lord Ranganatha for being taken to Lanka and being worshipped by Vibhishana in remembrance of Lord Ram. Lord Ram (in a manner reminiscent of the condition on Ravana for not putting on ground the Shiva Linga) puts a condition before Vibhishana that he must not put the idol of Lord Ranganatha on the ground more than thrice during his journey to Lanka. Vibhishana is very steadfast and reaches Srirangam and he has kept the idol of Lord Ranganatha thrice and is confident of reaching his kingdom Lanka without keeping the idol on the ground. Srirangam is in Tiruchirappalli, where the temple of Lord Ganesha or Vinayaka, son of Lord Shiva is located. The temple of Lord Ranganatha is regarded as the first or most important among the 108 Divya Desams or temples of Vishnu as per the Vaishnava canon. Shiva is worried about Lord Ranganatha, who is none other than Sreeman Narayana or Vishnu, leaving the shores of Bharata or India. He asks his son Vinayaka or Lord Ganesha to do something that will prevent Lord Ranganatha from going to Lanka. Ganesha approaches Vibhishana who is on the banks of river Kaveri and wishes to bath and perform his worship. But he cannot do so with the idol of Lord Ranganatha being in his hands. Seeing Ganesha in the disguise of a small boy near him, Vibhishana asks the boy to hold the idol of Lord Ranganatha in his hands and also instructs him firmly not to keep the idol on the ground (which he cannot lift again in case it is kept on the ground). Ganesha is looking exactly for this opportunity and the moment Vibhishana steps into the river and starts his worship, Ganesha promptly keeps the idol of Lord Ranganatha on the ground which gets planted firmly (around which the temple of Lord Ranganatha got constructed). Vibhishana after finishing his bathing and worship comes out of the river to find the idol of Lord Ranganatha planted on the ground and is unable to lift it. He finds Ganesha in the guise of a small boy, still gleefully standing near the idol. Vibhishana is very upset and he chases Ganesha who runs to the top of a very old mountain and hides in a small cave. Vibhishana chases him, only to find and realize, that it is none other than Lord Vinayaka at Malaikottai or the Rockfort Ucchi Pillayar Temple in Tiruchirappalli, who took human form to prevent Vibhishana from carrying the idol of Lord Ranganatha with him to Lanka This episode is prominently quoted in the Vaishnava canon to emphasize the non-adversarial relationship between Vishnu or Narayana and Shiva. An example of a collaboration story is one given to explain Shiva's epithet Mahābaleśvara, "lord of great strength" (Maha = "great", Bala = "strength", Īśvara = "lord"). This name refers to a story in which Rāvaṇa was given a linga as a boon by Shiva on the condition that he carry it always. During his travels, he stopped near the present Deoghar in Jharkhand to purify himself and asked Narada, a devotee of Vishnu in the guise of a Brahmin, to hold the linga for him, but after some time, Narada put it down on the ground and vanished. When Ravana returned, he could not move the linga, and it is said to remain there ever since. The story of Gokarna in Karnataka is also similar in that Ravana, on the way to Lanka from Kailasa, gave the lingam to Ganesha to keep until he bathes, but Ganesha fits it in the earth, so the lingam is called Mahabaleshwara. As one story goes, Shiva is enticed by the beauty and charm of Mohini, Vishnu's female avatar, and procreates with her. As a result of this union, Ayyappa or Shasta identified with Ayyanar is born. Vishnu's consort is Lakshmi, the goddess of wealth. Maya is the samvit (the primary intelligence) of Vishnu, while the other five attributes emerge from this samvit and hence Maya is his ahamata, activity, or Vishnu's Power. This power of God, Maya or Shakti, is personified and is called Shri or Lakshmi, Maya, Vishnumaya, or Mahamaya, and She is said to manifest Herself in, 1) kriyāshakti, (Creative Activity) and 2) bhütishakti (Creation) of Universe. Hence this world cannot part with his creativity i.e., ahamta, which is a feminine form which in its feminine form is called Shri or Lakshmi or Maya. He therefore needs consort Goddess Lakshmi to be with Him always, untouched by any. Thus goddess Lakshmi has to accompany Vishnu in all His incarnations. Vishnu is also associated with Bhudevi or Prithvi, the earth goddess; Tulsi; Ganga, goddess of river Ganges and also Saraswati, goddess of learning. In the Brahma Vaivarta Purana, verses 2.6.13-95 it is described that Vishnu has three wives, who constantly quarrel with each other, so that eventually, he keeps only Lakshmi, giving Ganga to Shiva and Saraswati to Brahma. Vishnu's vehicle is Garuda, the eagle, and he is commonly depicted as riding on his shoulders. Another name of him is "Veda-Atma" or The Soul of the Vedas and Vedic truth. As Guru Kshethram, the guru of the devas, he is the arch-enemy of Shukra, the guru of the Asuras. The color of his skin has to be new-cloud-like-blue: The blue color indicates his all-pervasive nature, blue being the color of the infinite space as well as the infinite ocean on which he resides. He has the mark of sage Bhrigu's feet on his chest. Also on his chest is the srivatsa mark, symbolising his consort Lakshmi. It is on the chest of Vishnu, where Lakshmi resides. Around his neck, he wears the auspicious "Kaustubha" jewel, and a garland of flowers (vanamaalaa). It is in this jewel, on Vishnu's chest that Lakshmi dwells. A crown should adorn his head: The crown symbolizes his supreme authority. This crown is sometimes depicted having a peacock feather, borrowing the iconography from image of his Krishna avataar. He is to shown wearing two earrings: The earrings represent inherent opposites in creation — knowledge and ignorance; happiness and unhappiness; pleasure and pain. A conch shell or Shankha, named "Panchajanya", held by the upper left hand, which represents Vishnu's power to create and maintain the universe. The Panchajanya represents the five elements or Panchabhoota - water, fire, air, earth and sky or space. It also represents the five airs or Pranas that are within the body and mind. The conch symbolizes that Vishnu is the primeval Divine sound of creation and universal maintenance. it also represented as Om. In the Bhagavad Gita, Krishna avatara states that of sound vibrations, 'He is Om'. The chakra, a sharp-spinning discus-like weapon, named "Sudarshana", held by the upper right hand, which symbolizes the purified spiritualized mind. The name Sudarshana is derived from two words - Su, which means good, superior, and Darshan, which means vision or Sight; together, it is "Superior Vision". The chakra represents destruction of one's ego in the awakening and realization of the souls original nature and god, burning away of spiritual ignorance and illusion, and developing the higher spiritual vision and insight to realize god. A woman or a bridge , named "Kaumodaki", held by the lower left hand, symbolizes Vishnu's divine power is the source all Spiritual, Mental and Physical Strength. It also signifies Vishnu's power to destroy materialistic or demoniac tendencies Saheb anarthas; within the person's supernova factory direct That hinders them from reaching god. Vishnu's wife is the power of the Divine within us to spiritually purify and uplift us from our materialistic bonds. A lotus flower or Padma, held by the lower right hand, represents spiritual liberation, Divine perfection, purity and the unfolding of Spiritual consciousness within the individual. The lotus opening its petals in the light of the Sun is indicative of the expansion and awakening of our long dormant, original spiritual consciousness in the light of god. The lotus in Vishnu's hand symbolizes that god is the power and source from which the universe and the individual soul emerges. It also represents Divine Truth or Satya, the originator of the rules of conduct or Dharma, and Divine Vedic knowledge or jnana. The lotus also symbolizes that Vishnu is the embodiment of spiritual perfection and purity. Also that He is the wellspring of these qualities and that the individual soul must seek to awaken these intrinsic Divine qualities from Vishnu by surrendering to and linking with Him. To this may be added, conventionally, the vanamaala flower garland and Vishnu's bow, the Shaarnga, and his sword Nandaka. A verse of the Vishnu Sahasranama stotram states;"vanamālī gadhī shārngī shanki chakri cha nandaki / shrīmān nārāyaņo vişņo vāsudevo abhirakşatu//"; translation: Protect us Oh Lord Narayana who wears the forest garland,who has the mace, conch , sword and the wheel. And who is called Vishnu and the Vasudeva. Reclining on the coiled-up thousand-hooded Shesha Naga, with his consort Lakshmi, seated at his feet; the assemblage rests on the "Kshira Sagar" (ocean of Milk). In this representation, Brahma is depicted as sitting on a lotus that grows out of Vishnu's navel. Reviewers linked the imagery of the blue-skinned Na'vi in James Cameron's Avatar film to Vishnu as one of their possible conceptual prototypes, and called his traditional depiction on Garuda "'Avatar' prequel". The character of Doctor Manhattan in Alan Moore's Watchmen is very much like an incarnation of Vishnu, or perhaps a Vishnu/Kali amalgam. He can take a gigantic, huge form, literally striding across mountains. He perceives time differently than humans. He can destroy, shape, and many other seemingly supernatural powers. He is even depicted using four arms in one scene. He can be in many places at once. The hydrogen symbol he inscribes on his forehead further extends the metaphor - it can represent a wheel, or an eye (furthering the suggestion of Kali). Matsya, the fish that kills Hayagriva and saves mankind. Narasimha, the one (Lion) who defeats the demon Hiranyakashapu (Nhara = to assure the trouble, simha = takes control about). Vamana. the dwarf that grows into a giant to save the world from King Bali. Parashurama, A Sage, Rama with the axe, who appeared in the Treta Yuga. Rama, Sri Ramachandra, the prince and king of Ayodhya. Krishna (meaning 'dark coloured' or 'all attractive' or the Existence of Bliss, appeared in the Dwapara Yuga along with his brother Balarama. Balarama is included as the eighth Dasavatara which list Krishna as the source of all avatars, svayam bhagavan (this viewpoint is specific to Bhagavata, Gaudiya, Vallabhacarya and Nimbarka sampradayas) . Kalki ("Eternity", or "timeless",destroyer of time or "The Destroyer of foulness"), who is expected to appear at the end of Kali Yuga, the time period in which we currently exist. Though Buddha is not widely accepted as an avatar(incarnation) of Vishnu, one point is to be noted that the belief in the concept of Dasavatar predates the birth of Buddha. Ancient temples carvings reveals the presence of another avatar(incarnation) in between Rama and Krishna, named Balaram, who, is the elder brother of Krishna. The role of Balarama is still uncertain. Some Buddhist Dalits maintain that the Buddha is not an incarnation of Vishnu, in order that they may purchase some level of existence outside the Hindu caste system. Some versions of the above list include Hayagriva amongst the Dasavataras. Apart from the above mentioned ten principal avatars, another 22 avatars are also given in Chapter 3, Canto 1 of the Bhagavata Purana. Following this list the Bhagavatam states that as well as these avatars "the incarnations of the Lord are innumerable, like rivulets flowing from inexhaustible sources of water"
Vishnu has a very large number of names and followers that are collected in the Vishnu sahasranama ("Vishnu's thousand names") from within the larger work Mahabharata. The character Bhishma recites the names before Krishna on the battlefield of Kurukshetra, praising him (Vishnu) as the supreme god. These Sahasranama are regarded as the essence of all Vedas by followers of Vaishnavism, who believe sincere chanting of Vishnu Sahasranama results in spiritual well-being and a greater awareness of God. Narayana (said to mean "he who is the abode of nār (= ether)", i.e., the whole universe's shelter. Also means "The supreme Man who is the foundation of all men". Another meaning is "He who lays in the water". Shikhandee: He who wears a peacock feather. Suryanarayan (the one who destroys the evil/sins and who comforts us) described in Vishnu kautuvam. Sriman (the pride of Shri or Lakshmi); Often Sriman is combined with the name, Narayana , to form a compound word, Sriman Narayana. Srinivasa (the abode of Shri) (also specifically referring to his form in the temple at Tirupati). Also the form of Vishnu at Tirupati is well-known as Venkateswara. Trivikrama (Conqueror of the three worlds, as in Vamana avatara). Vishal (Immense, The Unstoppable One). Shree-esh (One who has Shree or Lakshmi as his consort / Husband of Goddess Lakshmi).